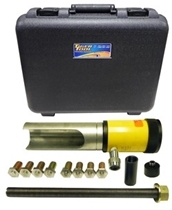 5th Wheel Tools include the 10705 Jost 5th wheel bracket pin puller. A 20 ton hydraulic cylinder creating 40,000 lbs of pulling power provides safe, fast, and effective removal of highly seized bracket pins. Tiger Tool 10705 Jost 5th Wheel Pin Puller features a 20 ton hydraulic cylinder creating 40,000 lbs of pulling power.